"For My Love of Wine": I am not Drinking any "@#!~ing" Merlot! "For My Love of Wine"
I am not Drinking any "@#!~ing" Merlot! I couldn't help myself to paraphrase the famous scene in the movie. I just don't know enough about Merlot. I remember one tasting many many years ago in San Francisco. Where I was poured both an estate Cabernet and an estate Merlot from a famous winery. I turned to my brother and said "These 2 wines taste the same". Would that still happen today, 12 years later? Probably! Would I be able to tell the difference in a Great Bordeaux with one being predominately Cabernet versus another that is predominately Merlot! Again, Probably not! The grape does get a little mixed up for me. Should we have a blind tasting of 3 Merlot's against 3 Cabernet's? Sounds good to me, but I am betting against myself to get perhaps 2 of them right. One from each side. The rest I would be guessing. This is probably why I can never be a Sommelier! I just don't have the skill. So what better way to make ourselves laugh at each other for even suggesting a Merlot tasting, but to pour 14 great Merlot wines. It's all fun in La Cañada and I thank Chris for picking this theme. 4 of the wines didn't count being that 2 were from Washington. Leonetti Cellars. The Matanzas Creek Winery was 21 years old and the 98 Paloma was a last minute "Go pull another bottle from the cellar and lets taste it wine". Chosen by me! Oh! the damage I could do to a friend's cellar if given the keys!! That 2001 Leonetti might of had a chance this night if it was allowed, but the theme called for wines made strictly from California. I thought and thought again what wine I could bring to this tasting. Originally I believed that I had 1 bottle of 2001 Duckhorn estate Merlot somewhere in my wine locker. Digging around on 2 separate trips, I couldn't find that bottle. It's probably better that I didn't!! I would of had to explain that "San Francisco, 2 wines taste the same story", to my group. They might of thought I was an idiot!! Then all of a sudden a majority of our group that night agreed that it would be difficult to pick out a great Merlot from a great Cabernet blind. Ok! I am not that much of an idiot anymore. So what was my Merlot of choice on this night?? I went back to what I was comfortable with. I very famous winemaker with a great history of making both Cabernet and Merlot. Mia Klein's Selene project. Let's face it I don't ever want to be labeled a "wine snob". Wine Geek just sounds funnier. I have never met Mia Klein, but her history and my love for her Sauvignon Blanc told me that this would be a great wine to share with my group. We brown bag and double blind taste all of our wines so I am proud to say that my wine of choice did well on this night. Landing firmly in 4th place overall. I few more high scores I might of taken 3rd or 2nd. On this night. it was our host of the evening that won the "best in show". 2003 Pride Merlot was our winner. It was the last wine that we tasted. Coincidentally~ The last 2 wines tasted were the big winners. #9 was Buccella's Merlot and #10 was the Pride. I was the first to taste the last 2 wines before the bottles had even gotten around the table to the other side. Buccella I scored 93 points. I had some experience with this wine a few weeks earlier and recognized it in the tasting. The wine had big rich fruit with a tiny pinch of chocolate. This is a wine that can only get better with age. Perhaps it was the reason that Pride won! 2 years older could of been the factor, because the minute Pride hit my lips, I declared it my favorite of the night. I have never tasted a bottle of Red wine from Pride before this night. The wine had all the structures in perfect balance. The nose showed hints of berry fruit, espresso and oak in perfect harmony. The wine's tannins were soft and not overbearing. On the palate, zero heat from the alcohol and elegance from the fruit. An overall perfect expression of Merlot!!! So come on people! Give the "@#!~ing" Merlot a chance with your dinner of the evening. It just might surprise you with thoughts that have vanished from your mind since seeing the now famous movie. But don't listen to a word I say!!! My mind is still hazy from all the wine we tasted that night. Here is the list in winning order. 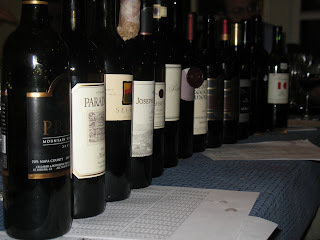 2003 Pride - 2005 Buccella - 2007 Robert Foley - 2006 Selene - 2000 Joseph Phelps - 2003 Robert Sinskey - 2005 Keenan - 2006 Shafer - 2005 Pahlmeyer - and last but not least 2006 Paradigm. Sorry Scott! I am actually embarrassed to admit that I picked Paradigm last. I just met Heidi Peterson Barrett the week before. She is too kool to come in last place. See! I told you I know nothing!! !